At first blush Simon Thacker’s Svara Kanti might give the impression that they are Shakti Redux, but could not be further from the truth. 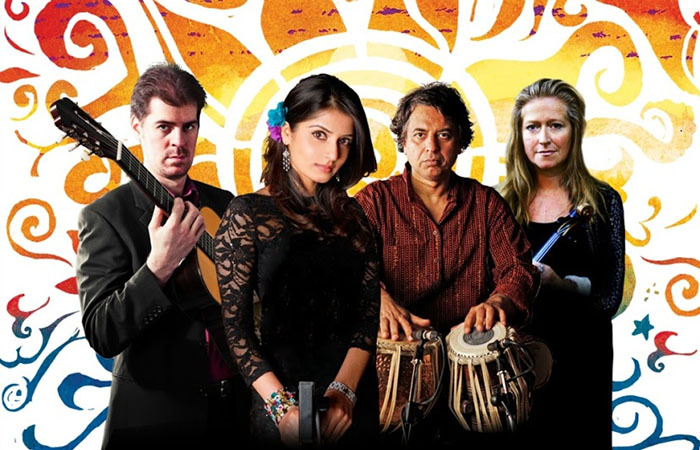 From the music on Rakshasa, it is clear that Mr. Thacker’s approach to fusing the European with the Indian is quite different from John McLaughlin and Shakti. If anything, Mr. Thacker’s approach to the music digs deeper into Hindustani (North Indian), Carnatic (South Indian) and the least-known, yet oldest form of Indian classical music: Dhrupad. Mr. Thacker’s working virtuosity also features flamenco sketches, classical cadenza-like movements and improvisations in the jazz idioms that appear in his brilliantly executed inflections as he plays classical guitar. Then there is the instrument itself—an unadorned classical guitar, unlike the one Mr. McLaughlin used when he played with Shakti, which had several resonating strings under the main six strings he actually played. Mr. Thacker might perhaps be the first to acknowledge the influence that John McLaughlin’s experiments have had on his consciousness—and they would very likely remain just that—but then again this might not even be the case. The late sitarist Ravi Shankar and his beloved tabla player, Alla Rakha preceded any music that Shakti did at the height of their powers. Moreover Mr. Shankar’s elder brother—the great musician and choreographer and dancer Uday Shankar—took Indian music to the doorstep of the rest of the world even before his better-known brother did with his 1923 ballet, Radha-Krishna, a celebrated event that featured the prima ballerina, Anna Pavlova. But perhaps it does not pay to labour the point more than this, but is almost breathtaking to allow the music to waft over mind and heart, where it is best heard. Rakshasa is an album overflowing with possibility. It is an album that features Simon Thacker’s unique perspective on Indian classical and ancient folk music; which includes experience of that great culture of South Asia. It also revolves around four principal characters: the guitarist, who is a sublime technician blessed with immense powers of expression, a rich dynamic and a musician with considerable compositional abilities. Mr. Thacker also reveals—based on the evidence on this record—that he might have contributed greatly to the language and literature of a music that has existed in some shape and form for thousands of years. The violinist, Jacqueline Shave, leader of the Britten Sinfonia, is an instrumentalist who brings a majestic technique, unbridled virtuosity and a wild imagination to this record. Her contributions are invaluable to the music. Despite her Western Classical background, she recalls the wonderful abilities of the great L. Subramaniam and his younger brother, L. Shankar, yet has a singular voice full of a floating grandeur that is marked by the ability to paint a myriad of hues and conjure wonderful textures in her “jugalbandhi” (musical dialogue) with Mr. Thacker and the tabla player, Sarvar Sabri, who in turn equals the magnificence of players such as Zakhir Hussain, Karsh Kale and Trilok Gurtu. Finally there is Ms. Japjit Kaur, an angelic voiced Indian classical vocalist who soars in a rarefied realm every time she is featured on this record. The leader of the pack clearly is Simon Thacker. His playing affects an ethereal beauty that is unsurpassed by most musicians today. In fact he might easily be the worthy equal of guitarists such as Egberto Gismonti and Ralph Towner. Not only is Mr. Thacker a sublime technician but his artistry seems to soar above that of most mere mortals. His ability to extract such meaning and expression from merely six nylon strings speaks of true genius. His lines are well-rounded and curvilinear. His phrases float like feathers loosed by majestic condors as they soar in the thin air above all else. He leaps from plane to plane with improvisations that are worked forwards and backwards; then inside-out. Yet these lines have a dexterous flowing continuity about them and like all great music that emerges out of India, tells a compelling story with soulful depth. The guitarist is also a fine composer and his feature, “Dhumaketu” features an extended “alaap” (the Indian classical music statement of a theme) which is set at the beginning of Indian “raagas”. As a matter of fact, this composition is based on the harmonic inventions of the Phrygian modes that correspond to one of the most celebrated “morning raagas”: Raag Bhairavi. Mr. Thacker’s other significant contribution to this fabulous project is “Rakshasa” a bold leap of faith. It not only is a brazen meld of Indian modes, invisible Tibetan chants and considerable electronic inventions. However, Mr. Thacker is not without considerable musical partnership. This comes in the form of the tabla player, Sarvar Sabri, who is magnificent on Nigel Osborne’s “The Five Elements” as well as on Terry Riley’s “SwarAmant”. In the former piece, Mr. Sabri’s extraordinary playing in “teen-taala” (the 16-beat cycle in Hindustani music) is nothing short of spectacular. The unfailing accuracy and percussive colour that he adds to the first “Akasha” movement of “The Five Elements” is nothing short of brilliant. Ms. Shave is the other part of this quartet and her playing is extraordinary throughout the album. Her playing in the Phrygian mode on Mr. Riley’s “SwarAmant” is deeply lyrical and she plays with almost telekinetic ability when she partners with Mr. Thacker on this piece. Ms. Kaur is one of the revelations of the album. Not only is she magnificent on Mr. Osborne’s classical piece “The Five Elements,” but she is equally at home when after several diaphanous waves, Hindustani changes to Carnatic modes on this album. Then Ms. Kaur also shifts gears as she becomes more puckish and skittering as she shows much vocalastic ingenuity on the trio of Punjabi folk songs “Kahnu Marda Chandariya Chamka”, “Main Tenu Yaad Aavanga” and “Shava Ghund Chuk Ke”. It will be a great travesty if this album is not discovered soon in North America for it is a sensational set in any forum; a brilliant musical odyssey that will resonate for years to come. Track Listing: Dhumaketu; The Five Elements: Ether-Akasha; Air-Vayu; Water-Jal; Fire-Agni; Earth-Prithvi; SwarAmant; Anusvara – 6th Prism; Svaranjali; Multani; Kahnu Marda Chandariya Chamka; Main Tenu Yaad Aavanga; Shava Ghund Chuk Ke; Rakshasa. Personnel: Simon Thacker: guitar; Japjit Kaur: voice: (2 – 6, 8, 11 – 13); Jacqueline Shave: violin; Sarvar Sabri: tabla.